In Columbus, on their last home game for the season, J.T. Barrett and the other seniors on the roster looked for a perfect send-off from friends, families, and coaches before heading to Ann Arbor to cap off their rollercoaster regular season. The game began with Ohio State taking the first possession of the game and it really did not take long for the Buckeyes to impose their will against the Illini. Their main objective was to run into the defenses teeth and they definitely made that happen. By the time the game ended, after all the smoke, the Buckeyes ran all over the defense and registered 325 rushing yards for 4 TDs. Mike Weber proved that he is healthy once again and for the second consecutive game, he went over the 100-yard mark again after busting through for a 43-yarder to essentially put the game further out of reach. Weber also notched another game where he scored multiple times. Dobbins and Barrett combined for 84 yards, with a TD a piece. After their day was done Antonio Williams came in for relief duty and he ran with determination and power before finishing the game with 19 carries and 74 yards. Barrett did not have a turnover this game, but he was an effective passer as he reached 101 total passing TDs in his career. He was 11 for 19 with 2 TDs hitting Victor and Baugh for touchdowns. Once the game had been decided, the backups Dwayne Haskins and Joe Burrow got their chance for a few reps, and Buckeye nation got a snapshot at what should be one hell of a QB battle next season along with Tate Martell for the starting QB spot. On the initial Haskins drive, he tried to take it past the first down marker, but he was hit hard and he fumbled the football and it was returned for Illinois’ first score of the game, effectively breaking the shutout. He was quickly benched in favor of Barrett for one last drive and after he finished the drive, Burrow was put in and he also fumbled but was able to recover before punting the ball. Illinois score with a younger QB after Crouch went down with an injury and he made the most of his shot because, on the first play, he rushed for a 9-yard score. The backups got a lot of work, but they showed a lot of promise. 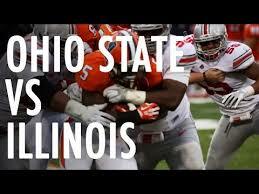 With the Buckeyes rolling, the game ended with a 52-14 victory as they have retained the trophy for another year. Another bit of good news is with TTUN losing to Wisconsin, Ohio State have secured the BIG 10 East division spot for the Conference Championship Game, but the next opponent on the docket is TTUN, which should be interesting, to say the least. For now, enjoy the win. Go Bucks.